Score another one for the good guys. Only a few days into the game, Khudabai lost his first ship to Agent Revis Owen. Now, those of you who are of a particular sensitivity and empathy may feel a bit of concern here. But don't worry about Agent Revis--he only sacrificed a gank Atron. Genuine newbies can find EVE confusing. There's a lot that the tutorial doesn't teach you. The rest can be learned from our Agents. Despite Revis' help, Khundabai was struggling. He seriously doubted his future in the game. No one in EVE treats "newbros" as well as our Agents do. We're extremely accommodating--within limits. On some things, there cannot be any compromise. The Code, for instance. It was clear that Agent Revis wasn't going to bend the rules of the Code. That meant Khundabai probably had no choice but to quit EVE forever. And if that happened, CCP would lose a source of good money. ...However, there was still one possibility. When all else fails, when all hope seems lost, there's still the Saviour of Highsec to consider. Khundabai threw a Hail James 315 pass and wrote me an EVEmail. So much rested on that EVEmail. Even though he probably had a sleepless night ahead of him, it was time for the newbie to log off and go to bed. He was tormented by dreams of PvP'ers killing him instead of NPCs. This miner clearly needed a change of perspective. 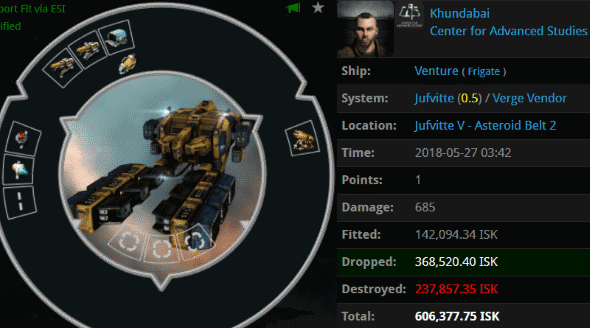 A proper EVE player would much prefer to lose a ship in PvP than PvE. 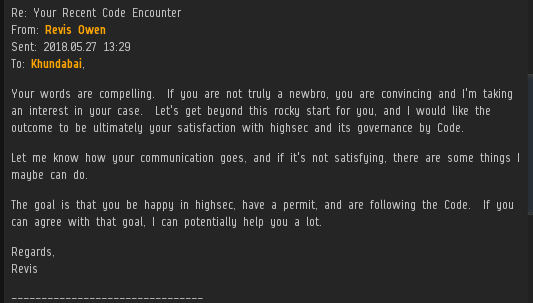 It would be some time before the Saviour of Highsec would respond to Khundabai's EVEmail (this post qualifies, I guess). Luckily, Revis was ready to offer the miner some expedited assistance. Revis introduced Khundabai to some good people. All of them confirmed that the Code is indeed legit, and that he definitely needed to buy a mining permit. It's amazing what happens to a gank recipient's attitude when he realizes that he wasn't "griefed" or bullied. When he recognizes that he was brought to justice, the world changes for him. So our Agents continue to change the world. It's been a long time since I played the tutorial but why do new players feel like their only money making option is to mine? I know my tutorial at least included basics of combat and low level security missions. Granted that is not the best way to enjoy the game or make money but still better than mining rocks. Lol think about it man. CCP devs are just a bunch of gankers like the rest of us, they set up the New Player Experience to weed out the shitters by giving them a "safe" carebear activity in a "safe" carebear area. In reality it's a way to easily identify the most ignorant and risk-adverse players, and an area that's easy to find them in, so the rest of us can shoot them. The reason some players choose to mine in highsec is because they are shitters and cowards and don't really belong in EVE anyway. The modern NPE sets new pilots up with a combat ship which they must lose at the very end, presumably in order to gain experience dealing with loss, and then they are given a replacement frigate. It gives them some free SP so they don't have to wait for skills to train. The NPE teaches them how to mine, refine, and manufacture items from a BPC. They are given a fitted Venture and a Venture BPC for future use. This miner is estimating 3hrs based off mining ore in a Corvette, reprocessing in his school station, and then waiting 90 minutes for a new Venture to build in the same station. He clearly hasn't visited the Career Agents yet or he would have loads of free ships of all kinds. The destruction of the starter ship was the strongest moment of the NPE. I forgot everything else in a week, but that moment gave a glimpse of what EvE is all about. The thought that some experience mining sooner than loss horrifies me. Buh bye new highsec miner, you won't be missed. Antiganking failing so hard right now. 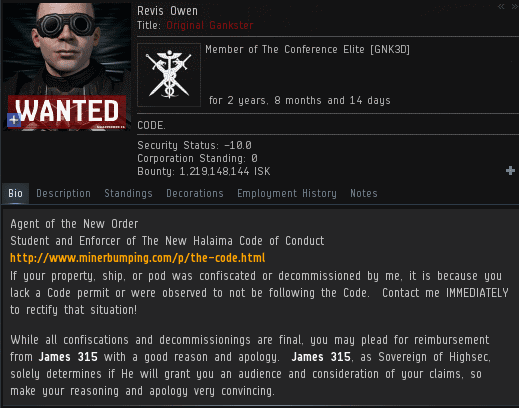 Maybe if Thomas wasn't stealing donations they could have the isk to help miners/newbies out. Thomas secretly converted to the gankside even before Gorila. 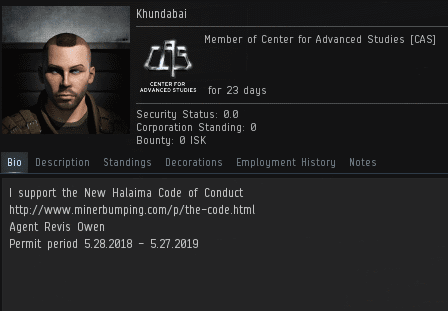 All this time he's been ripping off ag and funneling the ISK to CODE..
All those ag donations paid for Catalysts to kill more miners. It's almost poetic. Ah ha! Now we know the truth about that traitor Thomas en Chasteaux. I always thought he was a suspicious character. Now I see I was right about that liar. Good job being a back stabber Thomas. I should have known better than to trust someone like you. Have fun being a lackey, you sad sack of sh*t!